The kinds of trans continental runs that I participate in carry a high degree of danger and risk. 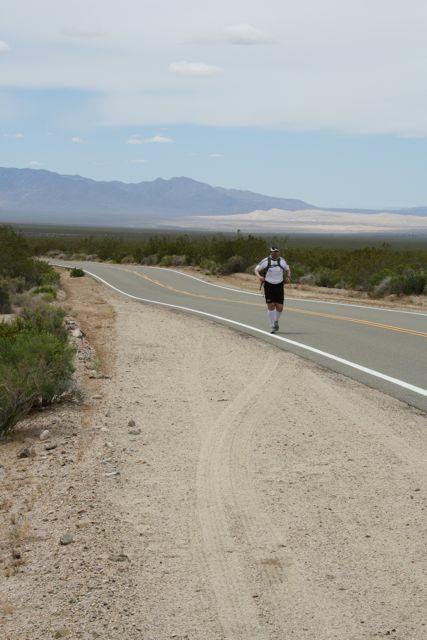 To date, I've ran through some of the most dangerously challenging and inhospitable places on the planet. The Mojave Desert, Death Valley, various US Interstate Roads, The Rocky Mountains and The Nullarbor to name but a few. I've ran at all times of the day and night in all kinds of conditions from 50 Celsius down to minus 9 Celsius in torrential monsoons, sweltering record temperatures and amidst spectacular thunder storms. Flies, stray dogs, spiders, snakes, huge road trains, drug dealers, gangs and armed members of the general public; The support team and I have had to endure a great deal during the runs across the USA and Australia. Together with whatever support team I've had with me, we've always had a good stab at mitigating each risk as it's presented to us on during the long trans continental journeys. To date, we've not had a single casualty or been involved in a major incident. I really do say with a huge hint of relief that, I'm very pleased with that record. My next major run, to be held during the British Summer of 2016, will undoubtedly see the support team and I be presented with more of the previously encountered risks and, in certain areas, some of an entirely new and unfamiliar nature. It is my honest belief, however, that with the same meticulous approach that has served us well in the past, we will be able to maintain our good record of delivering a successful run without major incident. It goes without saying that there will be huge amounts of physical and mental exhaustion and the possibility of further damage to my feet. In the same token, these are incredible journeys and for every blister there is a tale of human endurance to be told. This is very much the reader/viewer/listener/social media follower's journey as it is mine. I think the general public buy in to it with such amazing generosity and a lot of feedback I've received over the years suggests that many people really do feel a part of the run. I'm very protective of my brand and so are the 2 charities that I raise funds for of theirs. I'd never want to put the charities in a position that they don't want to be in. 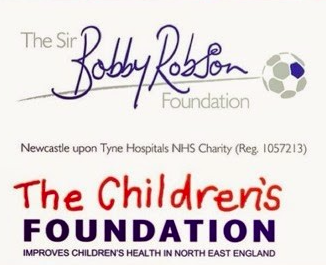 My fundraising events, whatever the level of risk, must never show The Sir Bobby Robson Foundation or The Children's Foundation in a bad light. Today saw the first major milestone of talking through the details of the 2016 run with the 2 charities and attempting to demonstrate the risks involved and how I intend to mitigate those risks. I must admit, that it wasn't as straightforward as I thought and I found myself having to answer some very good searching questions. The exact details of the route, the current and anticipated state of my feet, support logistics and my mental welfare (I should point out that was relating back to the final traumatic weeks in Australia. I'm not actually going mad!) were all brought up. I could mention a few other things but that would let the cat out of the bag as to where I'm running next. We talked for over an hour and I'm very relieved that both The Sir Bobby Robson Foundation and The Children's Foundation are the 2 charities that I'll continuing to raise funds for until 2016. I was very pleased with the reaction of both charities. There is no doubt in my mind that the general public are going to be blown away when they hear what is in store for 2016. It's going to be another incredible journey that I intend to share as frank and as fully as I can with whoever cares to watch, listen or read. I'll close this blog post reminding everyone how incredibly proud I am to represent such worthwhile, well ran charities that make a genuine difference to life in the North East of England. It's not a responsibility that I take for granted and I feel very lucky to do what I do and share that experience with 1000s of other people. I'm 100% convinced that, while it's going to take an unprecedented amount of effort, it's all going to come together nicely in 2016 as I attempt to raise at least another £50,000 for The Sir Bobby Robson Foundation and The Children's Foundation. More than ever before, I'm up for the challenge that lies ahead. There were many factors which led to the successful outcome of my journey across the USA and Australia. One of them was a recovery drink originally recommended to me by Northumbria University in 2011. As I was training in extreme temperatures on a treadmill in the Uni's environmental chamber it was a chance conversation that led me to learn about the product. I soon made contact with the product manufacturer and the rest, as they say, is history. The product in question is CherryActive and it gives me immense pleasure to announce that they will be supporting the campaign for my 2016 run. 30ml of CherryActive diluted in water (just like cordial) taken after exercise will minimise or, in the majority of cases, completely eradicate the muscular soreness that would be expected to follow during the following days. CherryActive is made purely from Montmorency Cherries. There is nothing else added. 30ml of CherryActive will assist in getting a better night's sleep. It's a versatile product and can be used in smoothies and many other recipes. It comes in various forms; Bottles that, once opened, must be kept refrigerated for subsequent use. A handy 30ml shot sachet which doesn't need to be kept in a fridge. For those that don't like the taste of cherries, it's available in capsule form. Finally, you can use the dried Montmerency cherries as a snack or use in many recipes. In 2005 John Carey founded CherryActive after discovering that Montmorency cherries were a natural remedy for his gout pain. As you may be able to tell, I'm a huge fan of CherryActive. I make no apologies for sounding like a salesman on commission (which I am not by the way). The product works amazingly well and almost everyone I know has tried it, is still using it and swears by it. I even know some people who use it as a hangover cure! They shall remain nameless! 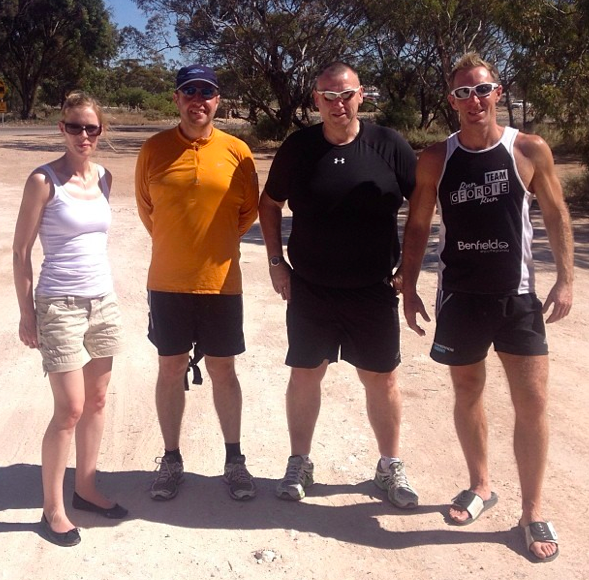 "CherryActive are happy to continue our support of Mark Allison, AKA Run Geordie Run, for his next grueling challenge. Here at CherryActive, we are not only blown away at Mark's achievements to date, but share his dedication and total commitment in doing something you believe in, whilst raising awareness and much-needed cash to a cause you hold so dear. Well done Mark, proud to work with you. John Carey and the CherryActive Team"
I'd like to say a huge thank you to John and the kind folks at CherryActive for their continued support. If you would like to try CherryActive then I've arranged a 10% discount code for use on their website. The code is "RGR1" and can be used at the checkout at www.cherryactive.co.uk. The build up to the next major run, to be held in 2016 continues. Of course, I'm meeting representatives from The Sir Bobby Robson Foundation and The Children's Foundation next week to get the "sign off" on the run. 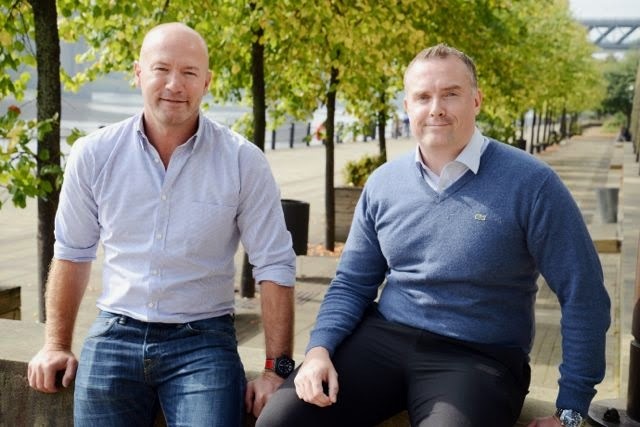 I was, however, lucky enough to meet up with former Newcastle United and England captain Alan Shearer last week to explain all about my plans. 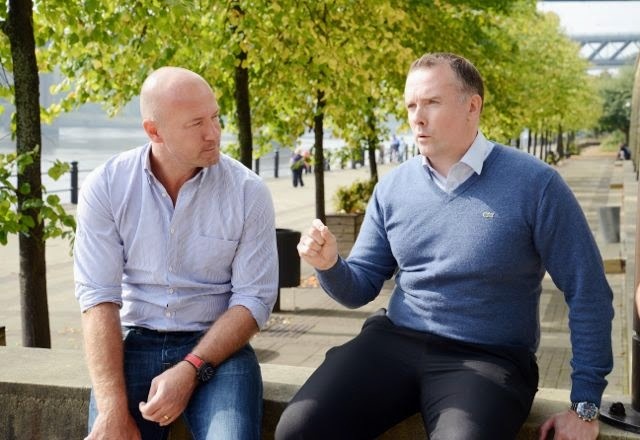 Alan Shearer is a patron of the Sir Bobby Robson Foundation and was very supportive of my run across Australia. I remember the following message was sent at a time when I needed it most while running down under. It was a surreal situation. 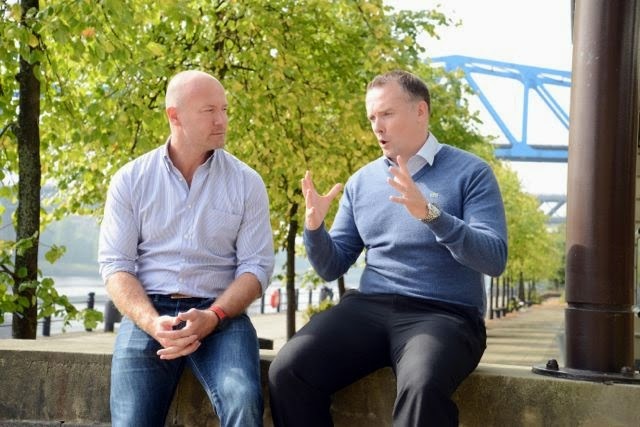 Not only was I telling a closely guarded secret to someone, I was telling it to one of my all time Geordie heroes. I talked in depth about the route I'd chosen for 2016 and I think the picture below was taken just as I was saying "I didn't realise just how huge a country ******** actually is". Of course, you'll get to find out just what those asterisks are hiding in 5 weeks time! I could tell from his reaction that he thought my plans for 2016 and beyond were very ambitious. Having ran down the UK and across the USA and Australia does help to give these kinds of conversations credibility however. Alan's parting words were "That is a mad plan but best of luck.". This is just what I wanted to hear and to receive the endorsement of a patron of The Sir Bobby Robson Foundation never mind a Geordie legend is getting things off to the best possible start. I'm very happy to report that the final total raised for the run across Australia in aid of The Sir Bobby Robson Foundation and The Children's Foundation is £55,126.60. If you made a donation then, on behalf of the 2 charities, thank you so much for your amazing generosity. All of the messages and donations made can be viewed at http://uk.virginmoneygiving.com/rungeordierun. I find that sum of money quite staggering and I know that my parents, had they still been alive to witness my fundraising events, would have been incredibly proud. Over the years, I've seen first hand just how much of a difference your donations make to the various charities. 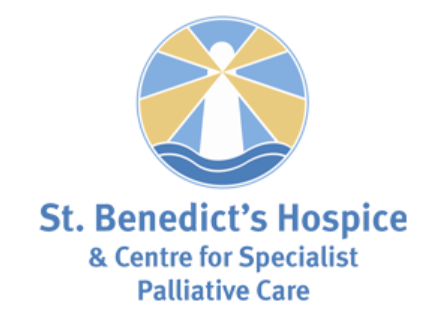 My Mam was a patient at St Benedict's Hospice. She saw out her final days there as she lost her battle with cancer. The palliative care that she received from the Hospice meant that she had as comfortable and dignified as possible end to her life. I've been lucky enough to see some of the world leading cancer treatment technology funded by the Sir Bobby Robson Foundation. You can read more about the ImageStream Imaging Flow Cytometer or the ultra-compact ABT Molecular Imaging Biomarker Generator as well other projects funded by the charity here. I sit on the Regional Small Grants Panel at The Children's Foundation. That panel has funded many projects in the local community over recent years. This is just the tip of the iceberg, however as the charity funds many other initiatives whose aim is the health, happiness and safety of children in the region. You can read more about that here. I know that the charity have some ambitious plans for the future and I will be learning more about that next month. I'll never be able to thank everyone who has donated so far in person. However, I like to think that over the years I have thanked as many people as I possibly could. The kind support shown towards my events is something that I never take for granted. If you have supported my events and the various charities in the past, then you have done an amazingly kind thing. You really should be very proud of yourself for helping to make a real difference to the well being of people in the North East of England. Once again, thank you so much for your kind support. It's been 9 months since the run across Australia finished and you could say that this blog post is long overdue. I've used this time to unwind from the trauma of Australia and try to make sense of it all. What went wrong and why? What went right and why? Where do I go from here? These are questions that I ask and get asked on an almost daily basis. I think I'm finally coming to terms with the trauma associated with the run across Australia. When I put myself through something as difficult as that run, I found that my weaknesses were exposed and I was on the brink mentally. I think that that those long hot Summer days down under were as close as I'll ever come to having a nervous breakdown. You just don't run across somewhere as inhospitable and desolate as Australia and get through it mentally or physically unscathed. I'm very lucky to have an amazing support network and this proved to be the difference, in the end, between success and failure. My Australia support team (Graham, Melanie, John, Jason, Carlton, Dave, Ian and Donna) played a blinder out there in very difficult circumstances. The support didn't end there with thousands of followers and well wishers on Twitter and Facebook also playing their part. I could go on and mention Real Radio, nufc.com, BBC and ITV and The Journal as well as my sponsors. I'd be here all night if I was to mention everyone who'd played a part in the success of the run across Australia. The run across Australia like all other events that went before it can be judged on 3 things. Did I make it from the start on the west coast of Australia to the finish on the east coast of Australia? YES! Did I manage to engage the general public and (virtually) take them on the journey with me? YES! Finally, and most importantly, were the general public generous enough to hit the fundraising target for The Sir Bobby Robson Foundation and The Children's Foundation? YES! The feelings and memories associated with those questions grow stronger every day. What is diminishing, I'm glad to say, is the overall trauma, feeling of paranoia and panic and the horrible remembrance of the pain I had to endure every day. 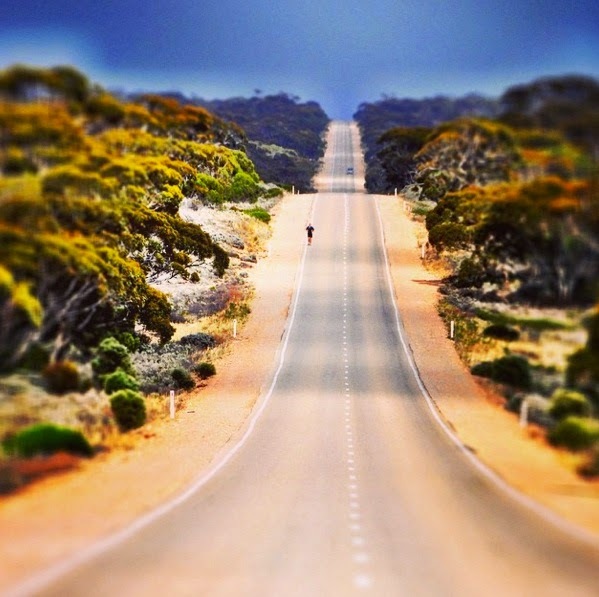 It has diminished to a point where I can genuinely say that I miss the day to day challenge that running 40 odd miles a day during the Australian Summer brings. Or the American Summer for that matter! I often find my mind drifting to certain sections and situations of the run across the USA and Australia. I see the many places, people, mountains, trees, lakes, deserts but mainly roads vividly and my thoughts and dreams are filled with these most incredible moments from the previous runs. A common interview question over the last few years is "Are you obsessed with running?". The answer I've always given is along the lines of "No. 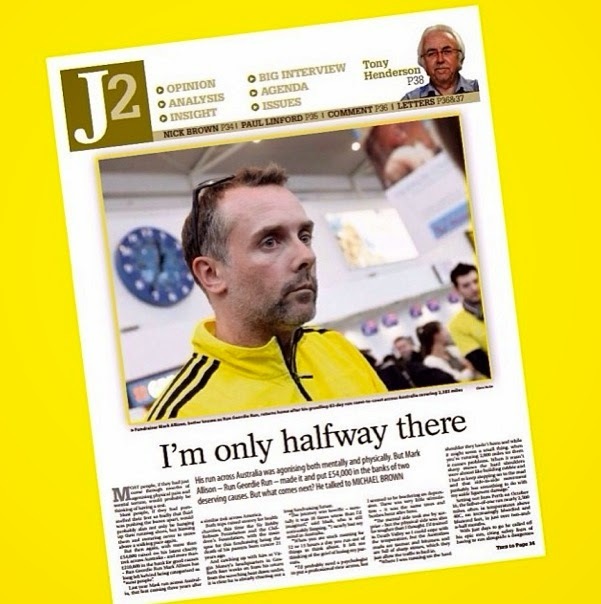 If it wasn't for the fundraising aspect I wouldn't do any running". This is now only partly true. In a bizarre twist of fate, I have found that I have become very obsessed with the very thing that has caused me so much physical and mental pain and exhaustion. 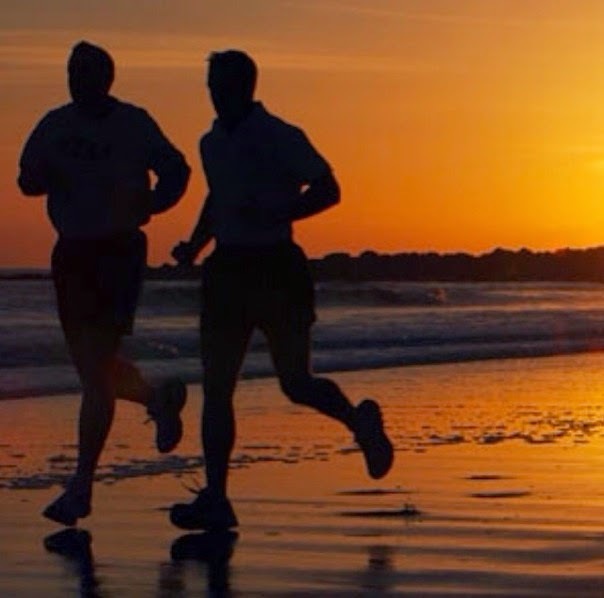 I'm not kidding when I say that I would like nothing more than to be able to get on a plane tomorrow to the USA or OZ and start running again from Huntington Beach, California or Cottesloe Beach, Perth. I think that I've acquired the same mindset that Forrest Gump had when, for no apparent reason, he just set off running. Of course, I have 2 very good reasons for running in the form of the Sir Bobby Robson Foundation and The Children's Foundation. I make no apologies for writing what some may think is absolute nonsense. The desire to run extreme distances is very much there and, like I said in an interview in The Journal in January, "I'm only half way there". I've been fundraising for 21 years and with a lot of luck and good health I'll be able to do the same for the next 21 years (or more). I had a dream back in January about the future of my fundraising and running. All of a sudden the direction of my future events became very clear. I'll be revealing details of my next run, scheduled for 2016, sometime during the week commencing 13th October. 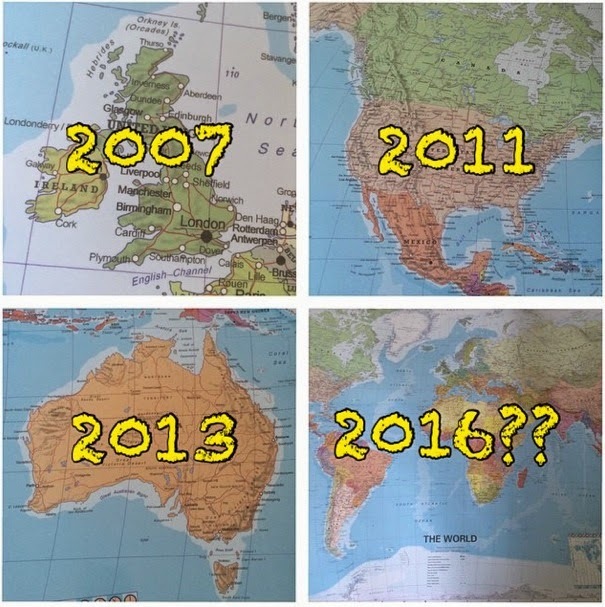 Knowing how running top to bottom of the UK and across the USA and Australia captured the public's imagination, I'm very excited to talk about the 2016 run and beyond. I'm meeting with The Sir Bobby Robson Foundation and The Children's Foundation on the 22nd September to get their "sign off" on my plans. As per usual, there will be a high degree of difficulty and risk associated with the 2016 run. I don't for one minute want to put the charities in a position they don't want to be in so this is a very important step to be taken before any actual ones are. It's the first major milestone for 2016 and despite what I'll be telling them, I'm confident of having their acceptance. The next step on the journey to 2016 is to start training. I'm looking forward to getting into David Fairlamb's gym tomorrow. Dave was very quick to offer to train me again. Unfortunately, I've spent the last 9 months eating bacon sandwiches, chocolate and drinking the odd beer here and there. Dave and I have got our work cut out once again! For reasons that will become clear after October's announcment, it is imperative that I go into the 2016 run at a much lower weight than previous events. For once, I'm confident that I'll be able to achieve this. It's not all about weight though. Unlike the build up to the run across Australia, I feel like I have my mental "edge" back. The experience gained in the USA and Australia are going to stand me in good stead. I have approximately 600 days before the 2016 event. I'm up for the challenge. Let the long battle for fitness commence tomorrow!